This PDF 1.5 document has been generated by Microsoft® Word 2013, and has been sent on pdf-archive.com on 04/07/2014 at 08:07, from IP address 117.211.x.x. The current document download page has been viewed 453 times. File size: 624 KB (9 pages). International Journal of Advances in Engineering &amp; Technology, Nov. 2013.
to remove the disadvantages of FL controller (steady-state error) and PI controller (overshoot and undershoot). FL controller and it improves the torque disturbances rejections . KEYWORDS: Induction Motor Indirect Vector Control, Hybrid Controller (PI+FL). sensor such as shaft encoder for speed control. fuzzy controllers. Section III and IV describes method of hybrid controller and related terminologies. Section V presents the experimental setup for further conclusions. the indirect method of field orientation. processes and a wide range of operation are assured through application of the vector-control. approach that will meet the speed tracking requirements even when detuning occurs. proposed for speed control of FOIM drives. speed control of FOIM drives, more specifically, direct field-oriented IM (DFOIM) drives. A.
width modulation (PWM) current control loop and external speed control loop. 𝑤ℎ𝑒𝑟𝑒 𝜏𝑟 = 𝐿𝑟 ⁄𝑅𝑟 is the rotor time constant. 𝑤𝑚 and slip frequency 𝑤𝑠𝑙 (Equation 5). regulators. The regulators use the measured and reference currents to form the inverter gating signals. The hybrid controller module has two controllers combined PI-controller and Fuzzy Controller. membership function for control variables. mode, the reference speed goes up from 120 (rad/s) to 160 (rad/s) at t=0.3 (s). controller are shown in Figure 6 and Figure 7. Figure 6: Speed Response of Induction Motor using PI -Control. Figure 7: Speed Response of Induction Motor using hybrid PI-fuzzy Control. Figure 8: Torque Response of Induction Motor using PI-Control. Figure 9: Torque Response of Induction Motor using hybrid PI-fuzzy Control. controller produces better performances in terms of rise time, overshoot, undershoot and settling time. in speed response at hybrid controller in comparison with PI and FL controllers. With Field-Oriented Control”, IJSTA, Vol. 2, pp 804-817.
in the Journal of Theoretical and Applied Information Technology, pp71-75. Induction Machine Drive,” IEEE Trans. Power Electronics, Vol. 12, No. 5, pp772 – 778. Advanced Technology &amp; Engineering Research, Vol.3, No.2,pp65-72. Conference, IAS Annu. Meeting, Vol. 1, pp341-346. Motors”, 5Th IEEE Conference On Industrial Electronics And Applications. 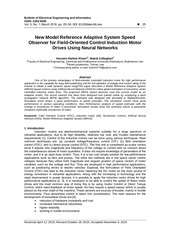 Induction Motor Drives Using Particle Swarm Optimization”, published by Oxford University Press. Transactions On Control System, vol.2, pp406-411. Heat Pump”, In proceedings of the IEEE Conference on control Applications, pp953-957. Motor Drive”, IETE Journal of Research, 48, pp441-447. of Computer Science, Vol.36, pp17-25. Gauri Vijaykumar Deshpande completed B. E. (Electrical Engineering) and pursuing M.
pursuing PhD from S. R. T. M. University, Nanded. Presently he is working as Asst. College of Engineering, Ambajogai, India. This file has been shared by a user of PDF Archive. Document ID: 00172396.